We are celebrating version 4 of Cicada Fuzz! Versions 1-3 each sold out in mere HOURS! 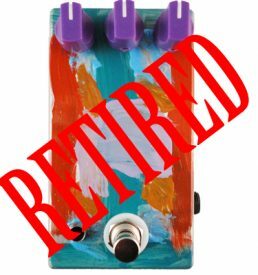 The CICADA FUZZ is our rare tremolo-fuzz made in homage to the 17 Year Periodical Cicada. It’s only right that we release 17 of each year’s version into the wild. The first three (3) units sold will be handpainted and the remaining 14 will be locally powdercoated and screenprinted by JuxtaPrints (frozen banana custard powdercoat with green, brown, and black ink). 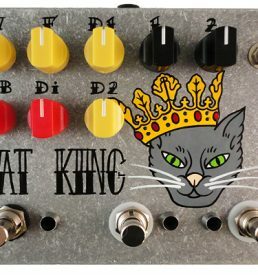 Includes true bypass on/off footswitch, volume pot, two speed pots, gate pot, voicing toggle, momentary oscillation footswitch, speed switcher footswitch, metamorphosis (reverb/delay) footswitch, and operation LED. The speed switcher footswitch lets you switch between speed 1 and 2 pots. Set each one different, like presets. 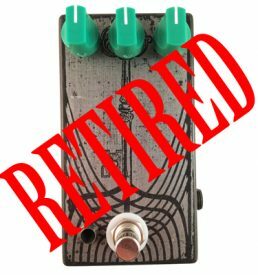 The Metamophosis footswitch warps delay time from very fast (almost doubling) to a slighter slower time providing a short slapback effect similar to the doppler effect one hears when cicadas call out. ONLY THE FIRST THREE ORDERS RECEIVED WILL BE PAINTED BY HAND. ALL OTHERS WILL BE SCREENPRINTED. Handpainted orders may take up to 8 weeks to ship.